I wasn’t totally sure what to expect from this week’s episode except that the medics would be having a busy shift. A busy shift is putting it mildly… I think I expected we would be concentrating on the patients rather than the doctors, but actually what shone through was how much these characters have grown on us, how they’ve grown on each other and become a real team. There was a real warmth in their dealings both with each other and the patients. Even enigmatic loner Proctor was taking time out to comfort his team members (though not because he cares, you understand!). It’s easy to imagine that, in this type of job, you can fail to see the patients as people, merely sets of symptoms and injuries requiring treatment, but Alpha Team were shown going that extra mile for every patient they treated. In Serena Warren’s case, we see how this caring can lead to an emotional backlash, and in Nurse Tuck’s case, something rather more serious. What I’m trying to say, in my inept way, is that instead of watching and analysing, making notes for my review, this week I sat back and let it all wash over me, just like the rock in the river, and before I knew it, I was at the end of the show, shaken, breathless and with a rather deliciously warm glow. 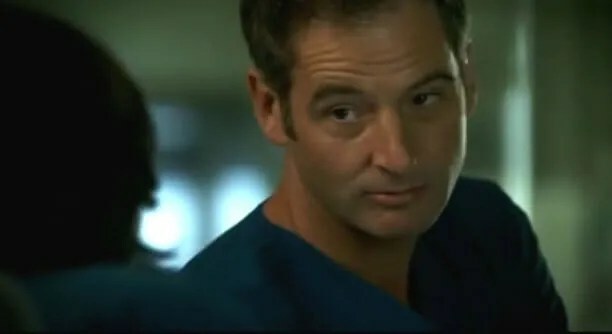 The moments that please me most of all are always when Jeremy Northam is afforded the opportunity to slow things right down, speak softly and confidentially with someone in that most beautiful of voices, and tell us something about himself in that poetic way of his. I can’t help but believe that Jeremy writes some of those moments himself. I have to say, I also love his masterful command in stressful situations and the way he’s all-seeing and all-knowing. Who needs Dr Rayner now? And then there’s the eccentricity…paper aeroplanes? I liked it, and I liked even more that it was in no way (that I could see) tied into any theme in the plot. Sometimes, that tent peg doesn’t need hammering and a bit of oddness thrown in for no reason is refreshing! 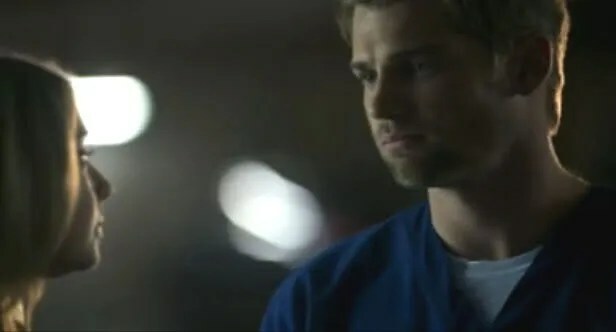 There continues to be great chemistry between Lana Parrilla’s Eva and Jeremy Northam’s Proctor, and for the first time I found myself liking Mike Vogel’s Chris. For his part, he’s still bemused by Proctor, but his digs about cricket and all things English seem more affectionate. Elizabeth Harnois’ Serena Warren still doesn’t look old enough to be there at all, and her struggles continue to be affectingly played. Her scene with Dr C at the end of the episode was intriguing…friendship, or something more? So, our familiarity with the characters and the set-up really paid dividends this week, and everything seemed to click: the fast pace, punctuated by the quieter moments; gratuitous eccentricity from Proctor; Serena discovers that knowledge of medicine isn’t the only tool of the trade she must get experienced with; Eva reveals a little of her humble background; Dr C shows a little chink of vulnerability in that customary macho facade, and everyone’s favourite Nurse Tuck is very unfairly rewarded for his kindness. And all this in between operations and procedures galore. I’m not a terribly squeamish person, but there was a LOT of blood in this episode (and the eye thing…not nice). Next week’s episode and the following one, which will be the season finale, work as a pair, and feature Kari Matchett. More of that very soon. Meantime, if you’re enjoying the show, please tell all your friends to watch. Here’s a little treat to keep you going until next week. I’ve noticed quite a few people are happening on this blog having searched for information about the music featured in the episodes. Calle Cubana features a song by Holly Long (who is the partner of show runner Jeffrey Lieber). It’s such a beautiful song I thought you might enjoy another listen. Check out SueVo’s review of Calle Cubana at The Exploding Egg. I’m with you all the way. Had to close my eyes from time to time for the bloody parts. Otherwise, this show simply gets better each time and I was on the edge of my seat for this episode. Sad that there are only two more to go this season. Thanks for the great blog, HM! 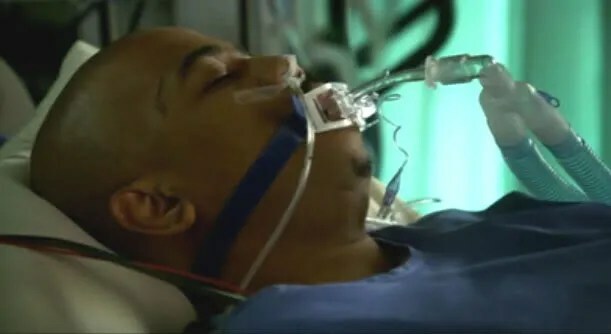 First time I won’t say, “best episode yet.” I saw the Hula Girl Tattoo guy was the attacker a mile away. There was something so corny and false about his story about his wife and kid dying in a fire and fighting a mugger for their pictures. I thought the paper airplanes, were as you said, “gratuitous eccentricity.” It was nice to see the team gelling as a team. My favorite moments were of course JN: the tourist conversation at the beginning with Eva and the moment when he patted Doctor Warren on the arm, twice. The whole escaped killer in the hospital, impromptu surgery in the laundry room were over done and cheesy. I’m glad at least that Dr. Warren didn’t get attacked in the parking garage. Next week: Things look bad for Doctor Proctor! We want to see him shirtless, but not not this way…. Aw Jenny! Let’s hope you’re more impressed next week, it looks like being a real corker of an episode, with Jeremy acting his socks off.